The amber glow of those flickering flames doesn't come cheap. To get the most bang from the big bucks you're spending on candles, give these quick tips a try. To coax a candle into burning more slowly so that you can enjoy it for a longer period of time, try out one of the following two methods—or, for the best possible results, do both in tandem. First things first, put the candle in the freezer. Yes, the freezer. By doing so, you are hardening the wax, which makes it melt more slowly and therefore last longer. The thinner the candle, the less time it needs to spend in the freezer. While a thick pillar candle might take six or eight hours to freeze, a thin taper might be ready within an hour or less. But as there’s no danger of a candle spending too long in the freezer, you might as well store all of your candles in the freezer, assuming there’s room. If there’s no space in there, simply slip your next-up-to-burn candle into the freezer on the morning or night before you’re planning to light it. Trick number two can be done in addition to, or separate from, the first. After letting the candle burn long enough for a pool of wax to collect around the wick, go ahead and blow out the flame. Then, acting fast, proceed to sprinkle table salt into the liquid wax. If necessary, use a toothpick to ensure that the salt actually mixes into the wax and doesn’t merely sit on the surface. Adding salt serves the same purpose as putting the candle in the freezer—it slows down the rate at which the wax melts, giving you a longer, more economical burn. When you use salt in addition to the freezing method, you’re doing all that can be done to squeeze extra time out of a candle. But it can also be helpful to keep the candle wick trimmed to about a quarter inch in length, because longer wicks tend to hasten burning. Beyond burn time, there’s another factor to consider. 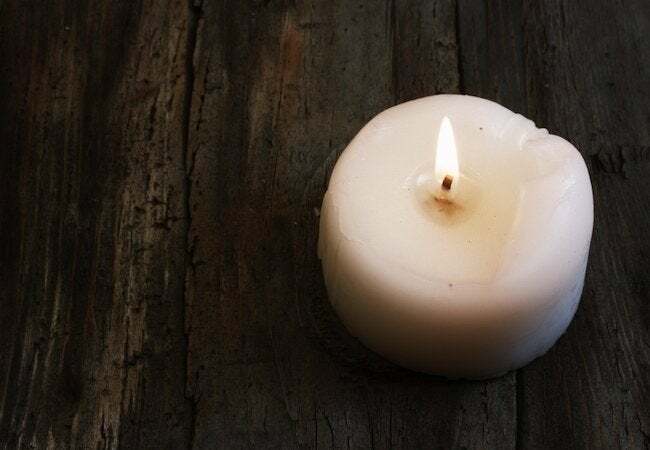 Have you ever had a candle that became more and more lopsided as the wick flamed its way down, leaving you at the end with nubby, waxen walls encircling a burned-out crater? The leftover wax signals that you didn’t get all you could have gotten from the candle. To get the most bang for your buck, you need to ensure that the candle burns both evenly and completely. What matters most here is how long you let the candle burn the first time you light it. It’s critical not to extinguish it until the pool of wax has extended across the diameter of the candle. Blow it out too soon, and you are in effect dooming the candle to leave excess wax; if it doesn’t melt on the first lighting, the dry, hard wax around the outside edge will almost never burn. Finally, remember not to leave the candle near a door or window or in any similarly drafty spot; not only is such a location unsafe, but it can also result in uneven burning.